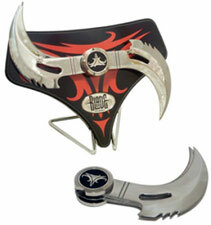 Bloodbath Glaive is an Official Replica as seen in the movie Blade and is 5 3/4" closed and 9 3/4" when open. Two bladed, mirror polished 420 stainless construction, and Glaive locks when in the open position. Also included is an attractive enameled display plaque with metal name plate which may be used for wall hanging or tabletop display. 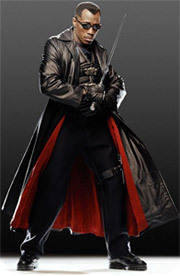 Officially licensed product from the movie Blade.